If you’re in the mood for some freaky cool entertainment this weekend, I’ve got just the thing for you. 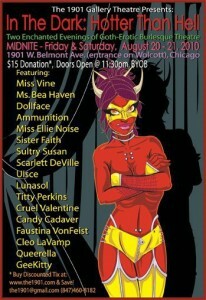 Fellow Chicago Fire Triber Jen Dollface will be performing tonight at two different venues. Go to Big Top JoJo’s Phenomenal Phantasmagoria tonight at Excalibur downtown from 8-10 for some amazing specialty acts, including burlesque, theater, comedy and more! You can buy advanced tickets to the show here or tickets will be available at the door as well. And for you night owls, you can see Dollface perform her first fire show at the 1901 Gallery’s In the Dark: Hotter than Hell show at midnight. $15 donation at the door, BYOB. Come on out and support your local performance artists!